There are heavy restrictions on foreigners driving cars in Vietnam, and my mode of transport since arriving here has been the taxi. Longer term I may need to find more economical means. For now, the relatively cheap cost of any of the different branded taxis is easy to swallow and, in the thick of rush hour traffic, it certainly feels the more secure option over and above riding a motorbike or a scooter. 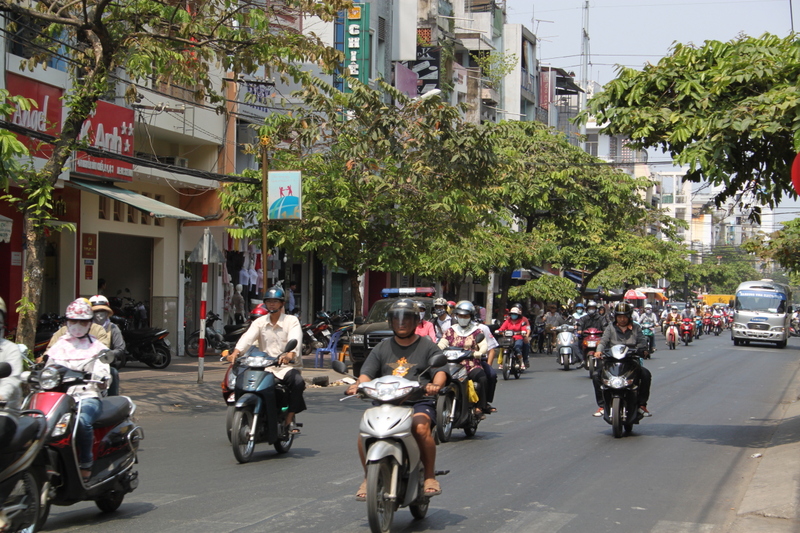 Riding bikes in Saigon is a way of life for the 3 million or so owners who zig-zag across the city each day. From the comfort of the backseat of a Vinasun taxi (our preferred choice at the moment) it is mesmerising watching the ebb and flow of traffic jostle for every last inch of space, in a bid to get from A to B as quick as possible. Various road traffic statistics have been offered to me about Vietnam’s daily bike accidents and fatalities. There are lots. Rather than qualify any of these, a point to take away is that most serious bike accidents apparently happen not due to alcohol or speeding but because too many riders, and other vehicle drivers, do not obey the rules of the road. In theory, you drive on the right over here. In practice this is a rule only loosely followed. The general tactic adopted by a scooter driver is to keep puttering along at all times, and if this means taking a route up the wrong side of the road or down a pavement then so be it. What is followed is a traffic pecking order rule of thumb which dictates that the larger your vehicle the larger your expectations about your right of way over everything else. Trucks and lorries sit at the top of this hierarchy, and only in close proximity to these do the taxis exert any type of caution. Scooters reside at the lower end of the food chain and, during most taxi journeys I take (and particularly when the traffic appears too tightly woven up to go anywhere fast) my driver will make an unannounced U-turn into a stream of oncoming scooters, gently parting them in all directions but at no time actually coming to a halt. Elsewhere in the world, this type of manoeuvre would result in a flurry of gesticulations and glaring, over here the bikes just deftly twitch and snake their way round the bonnet of the taxi. It won’t surprise you to hear that to obtain a scooter licence in Vietnam, rather than carry out a written theory test you are instead required to complete 5 levels of Super Mario on a Nintendo Wii. Helmets are now legally enforced over here for riders, but in another well established pecking order of things the law is more patchy in terms of headwear for passengers. Perhaps someone can fill in the gaps for me on the legalese, however from what I can tell, if you have the misfortune of being under the age of about 12, and riding on the back of a bike, then it is unlikely you will have the luxury of a brightly coloured helmet to cushion your fall. There are too many scooter stereo-types to list, and it is fun spotting new ones each day. Within 30 seconds of a heavy rain erupting, for example, literally every rider will have slipped on a raincoat, and the roads are set off to a rainbow of canvas on wheels, each displaying the corporate livery of the likes of Prudential or HSBC. At the moment I can’t help but be taken by the often ridiculous variety of odd shaped packages, boxes, bundles and – last week – metre high sheets of glass, that I’ve seen balanced on riders’ laps, or clung on to by someone straddled behind them. The harder you look the more likely you are to spot an even more incongruous sight than the one witnessed the day before. My current favourite being overtaken yesterday by a large wobbly pyrex fishtank, complete with trout, crab and eel, which was bouncing around on the back of a scooter tied down with the aid of a crinkly bunjee cord, and kept aloft mainly through cunning use of the back heels of the the rider’s white wellington boots, as he puffed down on his cigarette. Families of all numbers squash onto scooters. Mothers with newborn babies under muslins, and toddlers sat astride makeshift wooden stools with their arms crossed nonchalantly over the handlebars. Office workers. Young men with polished shoes and satchels between their feet, and women in pencil skirts sat daintily like porcelain dolls on the tips of their Vespa seats. The more aggressive drivers appear to be male blue collars, who rev slightly harder and seem slightly more determined to dart into the tight gaps in front of them, texting on their mobiles as they go. The message is fairly clear. To take up the art of scootering in Saigon requires nerve, gaming acumen and, ideally, a nicotine habit. Oh, to be 21 again. This entry was posted in Saigon Stuff and tagged scooters, traffic by saigonsays. Bookmark the permalink. Sounds like you’re having a fab time!!! I always remember being in Bangkok in a taxi and a family of 2 adults and 3 children pulled up on a scooter next to us!! I was very impressed. How is the new house?